A rare TV appearance of the last surviving person to witness the assassination of Abraham Lincoln’s assassination has turned up on YouTube. The video is from a February 1956 episode of the TV game show I’ve Got a S ecret. The show involved a notable person with a celebrity panel whose job it was to guess the secret behind what made the guest so famous. The video begins with host Garry Moore walking backstage to help an elderly man make his entrance. Moore explains that the man had fallen down some stairs in his hotel room and gave himself a black eye. ‘We urged him not to come onto the show tonight as a matter of fact. We finally got in touch with his doctor, and the doctor said it was up to Mr Seymour. Mr Seymour said he wouldn’t miss it, so here he is,’ Moore says to applause. Mr Seymour appeared on the show about two years after his story was written in the pages of the Milwaukee Sentinel, in which he recounted the day Lincoln was assassinated. Moore, speaking for Mr Seymour, said that the man, who was five years old at the time, did not realize Lincoln had been shot, only that he saw a man jump from the balcony. That man, of course, was John Wilkes Booth, the assassin. ‘I was scared to death,’ Mr Seymour says. 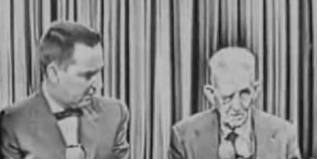 Although the celebrity panel was able to guess the secret, Mr Seymour was given the $80 prize and a can of Prince Albert pipe tobacco for appearing on the show. 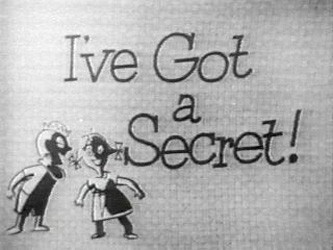 “I’ve Got a Secret” was one of my favorite shows to watch when I was very young. I do recall seeing this episode on youtube a long time ago. Miraculous indeed. Soon, one of those that witnessed the assassination of JFK may make a rebirth of that show. Before my time. I thought it was “What’s My Line” when I first saw the clip. Very cool though.